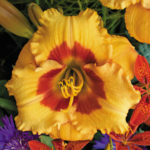 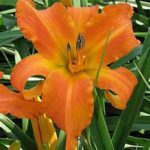 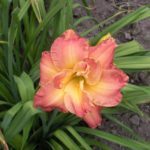 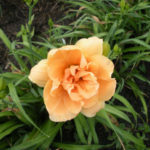 Golden orange, prominent sienna eye, red ruffled edge, 65 cm flowerscapes, 12cm blooms, blooms midsummer, attracts butterflies, full sun to part shade. 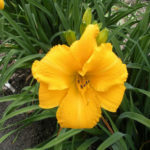 LARGE. 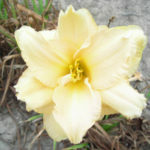 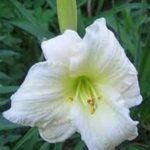 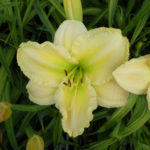 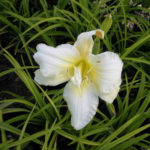 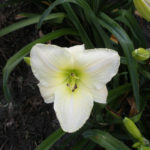 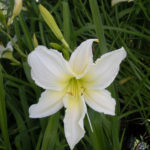 (Rebloomer) Ivory, yellow green throat, 75 cm flowerscapes, 15 cm blooms, double, fragrant, blooms late summer, full sun to partial shade, dormant, diploid. 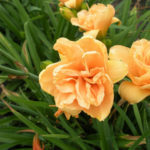 (Rebloomer) Orange, gold green throat, 50 cm flowerscapes, 12 cm blooms, fragrant, blooms mid summer, full sun to partial shade, tetraploid, semi evergreen. 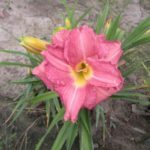 (Rebloomer) Pink, red eye, green throat, 45 cm flowerscapes, 7 cm blooms, fragrant, blooms mid to late summer, full sun to partial shade, tetraploid, dormant. 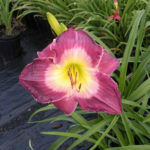 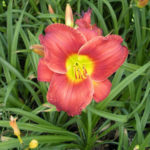 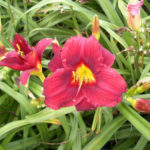 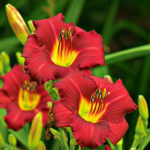 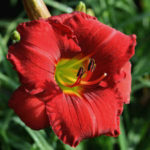 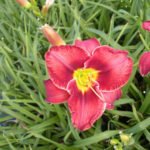 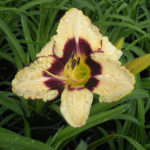 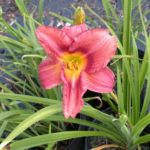 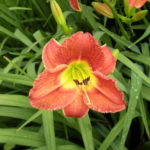 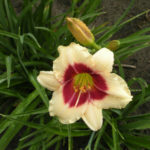 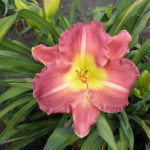 (Rebloomer) Rose red, yellow chalky red eye, yellow throat, 80 cm flowerscapes, 15 cm blooms, blooms mid summer, full sun to partial shade, tetraploid. 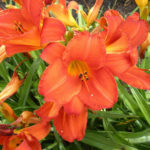 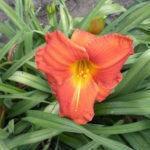 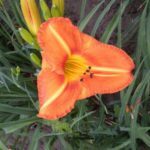 Orange, red eye, gold throat, 70 cm flowerscapes, 14 cm blooms, extended bloom time, blooms early summer, full sun to partial shade, tetraploid, semi evergreen. 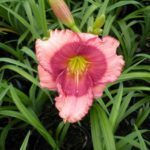 Scarlet, cream edge, green throat, 60 cm flowerscapes, 10 cm blooms, blooms mid to late summer, full sun to partial shade, dormant, diploid. 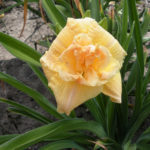 Fleur rose, oeil rose, auréole et gorge jaune, hampe 75 cm, fleur 14 cm, parfumée, fleurit mi à fin été, plein soleil à mi ombre, tétraploïde, dormant. 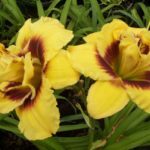 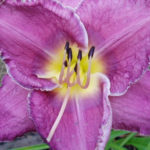 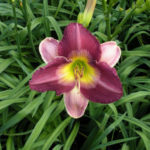 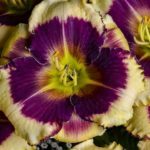 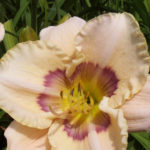 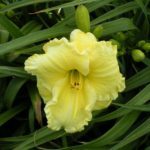 (Rebloomer) Purple, chalky lavender eye, yellow green throat, 65 cm flowerscapes, 12 cm blooms, blooms mid summer, full sun to partial shade, tetraploid, evergreen. 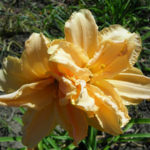 Fleur pourpre, oeil lavande, gorge verte, hampe 65 cm, fleur 12 cm, fleurit mi été, plein soleil à mi ombre, tétraploïde, persistant, refleurit. 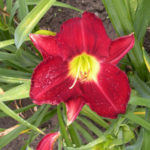 Cranberry red, green throat, 70 cm flowerscapes, 10 cm blooms, fragrant, blooms mid summer, full sun to partial shade, dormant, diploid. 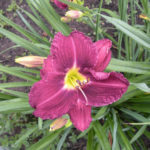 (Rebloomer) Rose pink, red purple eye, green throat, 50 cm flowerscapes, 7 cm blooms, blooms late summer, full sun to partial shade, diploid, semi evergreen. 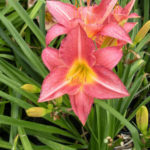 (Rebloomer) Peach pink, red eye, green throat, 65 cm flowerscapes, 15 cm blooms, blooms mid to late summer, full sun to partial shade, tetraploid, semi evergreen. 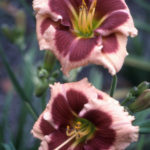 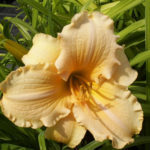 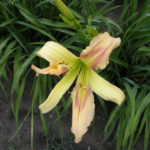 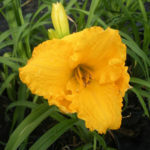 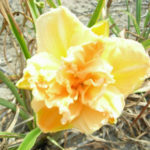 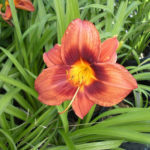 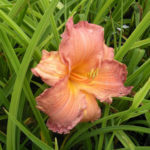 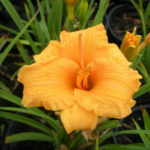 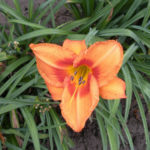 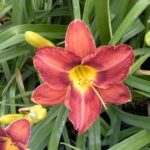 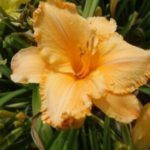 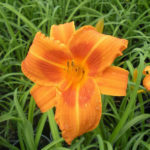 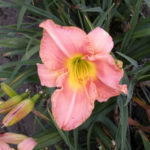 (Rebloomer) Orange brown, yellow midribs, 70 cm flowerscapes, 11 cm blooms, double, extended bloom time, blooms mid to late summer, full sun to partial shade, dormant, diploid. 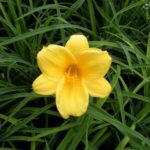 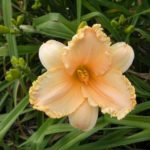 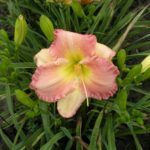 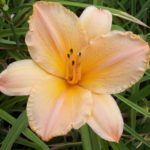 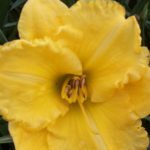 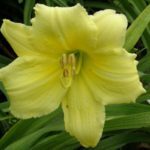 Gold, 75 cm flowerscapes, 8 cm blooms, double, extended bloom time, blooms mid to late summer, full sun to partial shade, dormant, diploid. 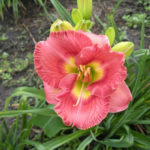 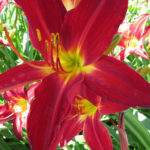 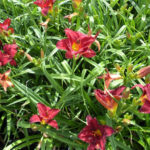 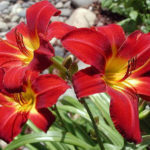 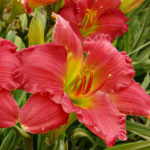 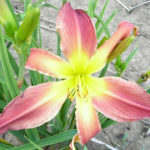 red, green yellow throat, 61 cm flowerscapes, 11 cm blooms, double, fragrant, blooms mid to late summer, full sun to partial shade, dormant, tetraploid. 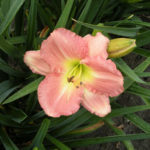 (Rebloomer) Pink green blend, green throat, 65 cm flowerscapes, 15 cm blooms, fragrant, blooms mid summer, full sun to partial shade, tetraploid, semi evergreen. 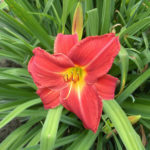 Red, green throat, 55 cm flowerscapes, 14 cm blooms, extended bloom time, blooms early to mid summer, full sun to partial shade, tetraploid, evergreen. 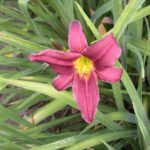 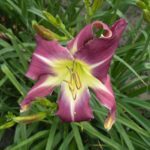 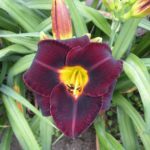 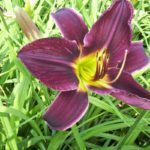 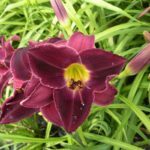 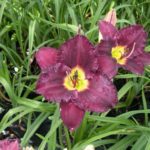 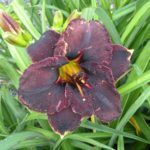 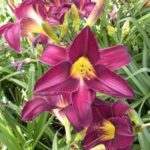 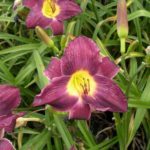 Dark purple, green throat, 70 cm flowerscapes, 13 cm blooms, blooms mid to late summer, full sun to partial shade, tetraploid, dormant. 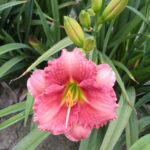 (Rebloomer) Pink, green throat, 55 cm flowerscapes, 14 cm blooms, blooms mid to late summer, full sun to partial shade, tetraploid, semi evergreen. 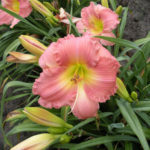 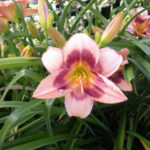 (Rebloomer) Pink peach blend, green throat, 70 cm flowerscapes, 12 cm blooms, fragrant, blooms late summer, full sun to partial shade, tetraploid, dormant. 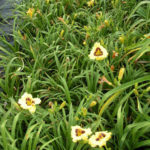 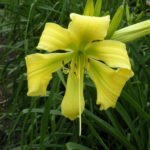 Dark yellow, green throat, 55 cm flowerscapes, 12 cm blooms, fragrant, blooms mid to late summer, full sun to partial shade, tetraploid, semi evergreen. 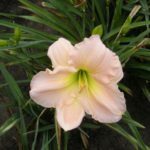 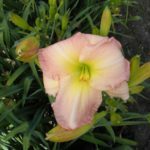 (Rebloomer) Light pink, rose red eye, green throat, 65 cm flowerscapes, 11 cm blooms, fragrant, blooms mid to late summer, full sun to partial shade, tetraploid, dormant. 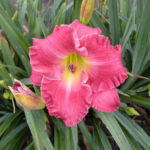 (Rebloomer) Pink blend, red eye, green throat, 62 cm flowerscapes, 12 cm blooms, fragrant, extended bloom time, blooms late summer, full sun to partial shade, tetraploid, dormant. 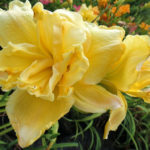 (Rebloomer) Light rose pink, yellow green throat, 75 cm flowerscapes, 14 cm blooms, double, fragrant, blooms late summer, full sun to partial shade, dormant, diploid. 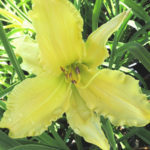 (Rebloomer) Rose blend, green yellow throat, 60 cm flowerscapes, 14 cm blooms, double, fragrant, blooms mid to late summer, full sun to partial shade, dormant, diploid. 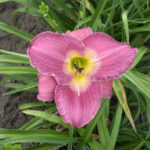 Mauve rose blend, green throat, 55 cm flowerscapes, 15 cm blooms, fragrant, extended bloom time, early midseason, tetraploid, dormant, full sun to partial shade, LARGE. 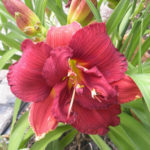 (Rebloomer) Red, green throat, 75 cm flowerscapes, 15 cm blooms, fragrant, blooms mid to late summer, full sun to partial shade, tetraploid, evergreen. 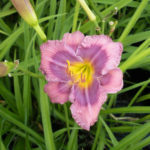 (Rebloomer) Lavender blue bitone, green throat, 55 cm flowerscapes, 14 cm blooms, fragrant, blooms late summer, full sun to partial shade, dormant, diploid. 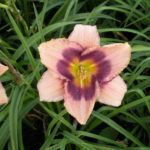 (Rebloomer) Purple, lavender edge, purple watermark, green throat, 50 cm flowerscapes, 11 cm blooms, blooms mid summer, full sun to partial shade, diploid, semi evergreen. 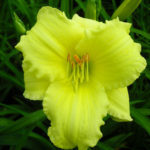 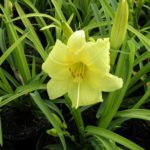 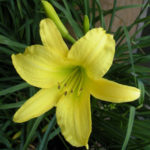 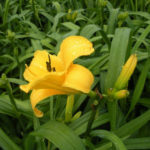 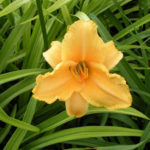 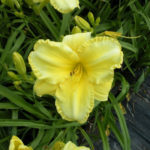 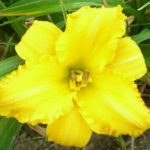 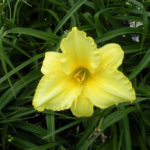 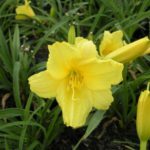 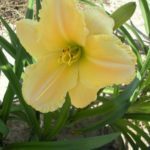 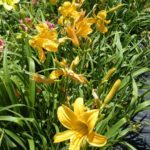 (Rebloomer) Yellow, green throat, 80 cm flowerscapes, 15 cm blooms, double, blooms late summer, full sun to partial shade, diploid, semi evergreen. 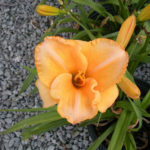 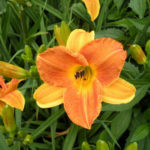 Yellow, burnt orange eye, 51 cm flowerscapes, 15 cm blooms, extended bloom time, blooms mid summer, full sun to partial shade, diploid, semi evergreen. 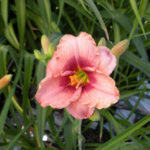 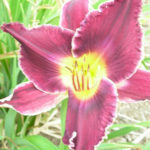 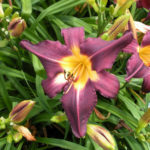 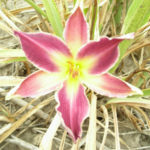 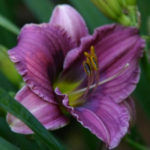 Purple, 30 cm flowerscapes, 5 cm blooms, blooms early to mid summer, full sun to partial shade, diploid, semi evergreen. 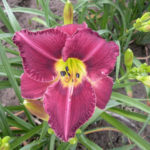 (Rebloomer) Rose blend, darker eye, green throat, 60 cm flowerscapes, 11 cm blooms, extended bloom time, blooms mid to late summer, full sun to partial shade, diploid, semi evergreen. 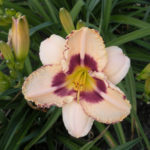 (Rebloomer) Purple blend, cream eye and edge, 70 cm flowerscapes, 13 cm blooms, extended bloom time, blooms mid to late summer, full sun to partial shade, tetraploid, semi evergreen. 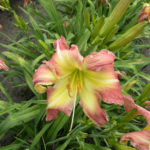 Peach, red eye, yellow green throat, 66 cm flowerscapes, 18 cm blooms, fragrant, blooms mid to late summer, full sun to partial shade, tetraploid, evergreen. 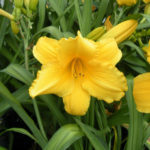 Gold, green throat, 60 cm flowerscapes, 13 cm blooms, fragrant, extended bloom time, blooms mid summer, full sun to partial shade, tetraploid, semi evergreen. 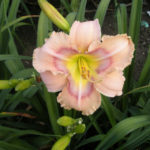 (Rebloomer) Light pink, green throat, 65 cm flowerscapes, 17 cm blooms, double, fragrant, blooms mid to late summer, full sun to partial shade, diploid, semi evergreen. 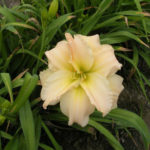 (Rebloomer) Pink beige bitone, beige throat, 75 cm flowerscapes, 17 cm blooms, double, fragrant, blooms mid to late summer, full sun to partial shade, diploid, semi evergreen. 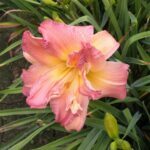 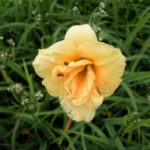 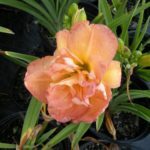 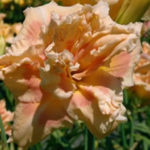 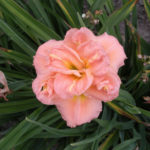 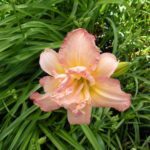 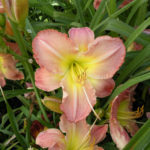 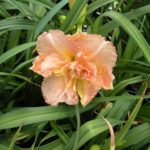 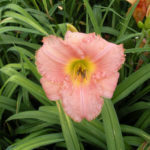 Peach apricot blend, green throat, 70 cm flowerscapes, 14 cm blooms, fragrant, blooms late summer to early fall, full sun to partial shade, tetraploid, dormant. 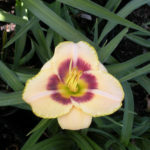 (Rebloomer) Raspberry, darker eye, yellow gold throat, 65 cm flowerscapes, 17 cm blooms, fragrant, blooms mid summer, full sun to partial shade, dormant, tetraploid. 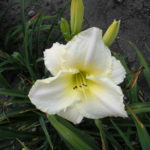 (Rebloomer) Cream white, purple eye, green throat, 65 cm flowerscapes, 12 cm blooms, fragrant, blooms late summer, full sun to partial shade, tetraploid, semi evergreen. 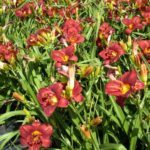 Red, yellow green throat, 65 cm flowerscapes, 14 cm blooms, double, blooms mid summer, full sun to partial shade, tetraploid, dormant. 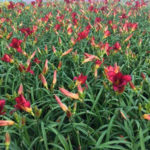 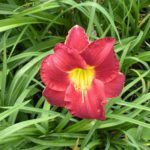 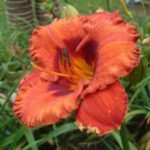 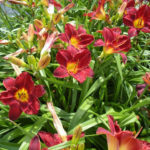 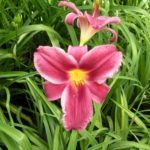 (Rebloomer) Red, yellow green throat, 90 cm flowerscapes, 19 cm blooms, blooms mid summer, full sun to partial shade, tetraploid, dormant. 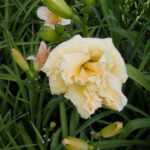 Rose, 60 cm flowerscapes, 17 cm blooms, fragrant, extended bloom time, blooms mid summer, full sun to partial shade, tetraploid, dormant. 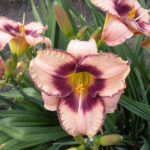 (Rebloomer) Lavender, purple eye, silver edge, green throat, 62 cm flowerscapes, 12 cm blooms, fragrant, blooms mid to late summer, full sun to partial shade, tetraploid, semi evergreen. 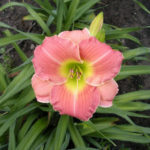 Rose pink, green throat, 57 cm flowerscapes, 15 cm blooms, fragrant, extended bloom time, blooms mid summer, full sun to partial shade, tetraploid, dormant. 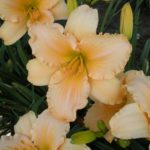 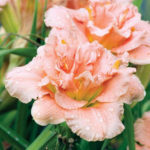 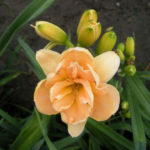 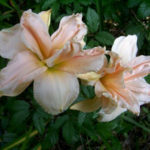 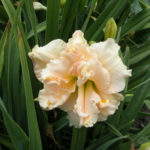 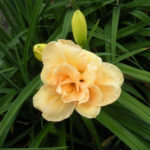 Light apricot, green throat, 45 cm flowerscapes, 14 cm blooms, double, fragrant, extended bloom time, blooms mid to late summer, full sun to partial shade, dormant, diploid. 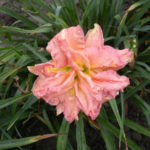 Fleur mélange rose, oeil rose rouge, gorge vert or, hampe 65 cm, fleur 11 cm, floraison prolongée, fleurit mi été, plein soleil à mi ombre, tétraploïde, semi persistant, refleurit. 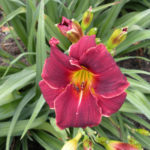 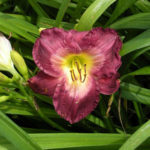 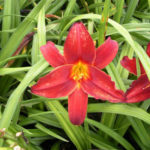 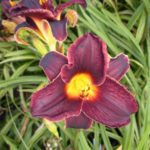 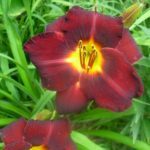 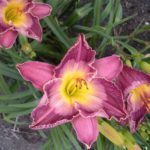 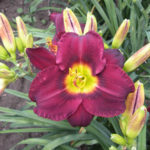 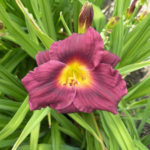 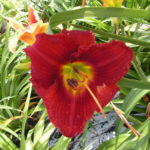 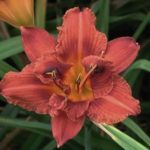 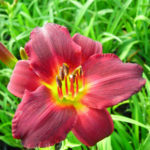 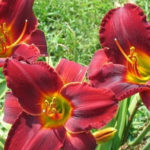 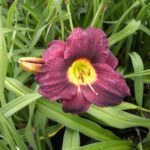 (Rebloomer) Dark red, darker eye, green throat, 60 cm flowerscapes, 15 cm blooms, fragrant, extended bloom time, blooms early to mid summer, full sun to partial shade, tetraploid, semi evergreen. 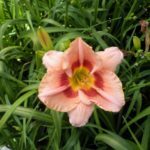 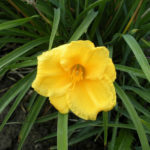 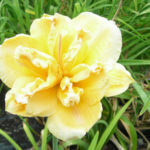 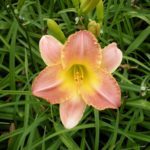 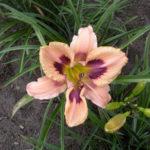 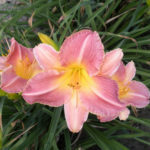 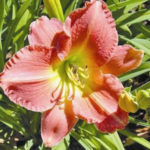 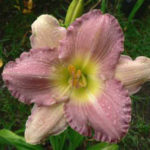 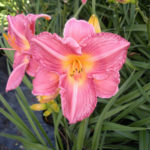 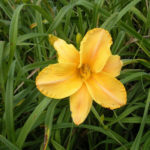 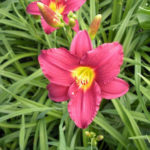 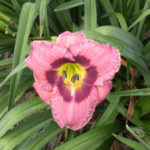 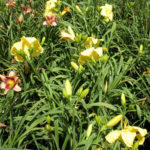 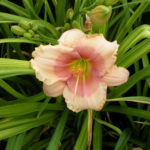 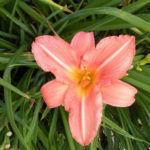 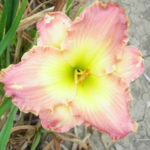 (Rebloomer) Yellow pink, green throat, 53 cm flowerscapes, 15 cm blooms, fragrant, blooms late summer to early fall, full sun to partial shade, tetraploid, dormant. 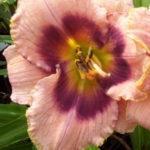 Lavender, purple halo, green throat, 65 cm flowerscapes, 14 cm blooms, fragrant, blooms mid summer, full sun to partial shade, tetraploid, dormant. 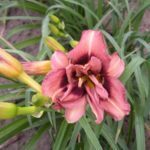 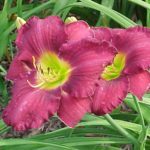 Red, darker eye, green throat, 55 cm flowerscapes, 13 cm blooms, double, blooms mid to late summer, full sun to partial shade, dormant, diploid. 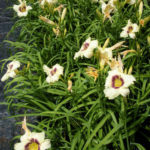 Purple blend, white edge, 65 cm flowerscapes, 15 cm blooms, fragrant, extended bloom time, blooms mid summer, full sun to partial shade, tetraploid, semi evergreen. 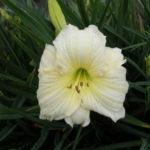 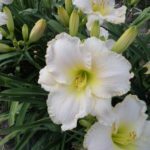 (Rebloomer) Near white, green throat, 75 cm flowerscapes, 14 cm blooms, fragrant, extended bloom time, blooms late summer, full sun to partial shade, tetraploid, semi evergreen. 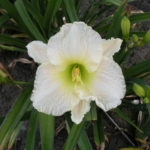 (Rebloomer) Near white, green throat, 62 cm flowerscapes, 14 cm blooms, fragrant, blooms mid to late summer, full sun to partial shade, tetraploid, dormant. 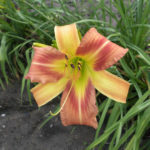 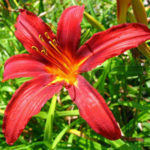 (Rebloomer) Amber, 70 cm flowerscapes, 15 cm blooms, double, extended bloom time, blooms mid to late summer, full sun to partial shade, dormant, diploid, nocturnal. 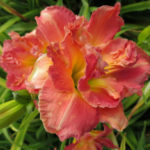 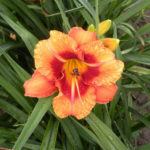 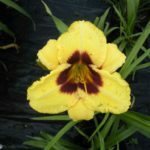 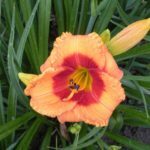 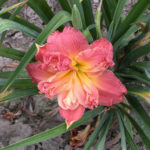 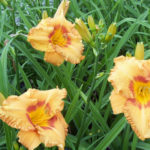 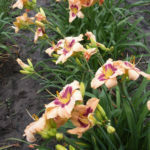 Orange yellow red blend, yellow throat, 85 cm flowerscapes, 12 cm blooms, blooms mid to late summer, full sun to partial shade, tetraploid, dormant.